The objective of the present paper is to study the ability of an order of magnitude analysis (Garandet et al., 2012) to give a realistic picture of segregation patterns in vertical Bridgman configurations, on the basis of hydrodynamic simulations. 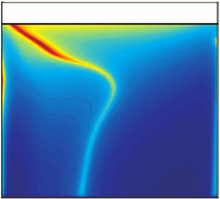 The scaling analysis leads to an analytical formulation of the solute boundary layer, involving the wall-shear stress at the solid/liquid interface. In order to test this analytical model, transient simulations of solute segregation in a 2D lid driven cavity configuration have been performed. The developed analytical model, which involves a quasi-steady approximation, is in good agreement with the numerical time-dependent results. The key results of this work are the correlation of segregation patterns in the solid with flow patterns in the liquid and the ability of the analytical model to describe lateral segregations and to capture unsteadiness in the limit of slow variations associated with Bridgman configurations.